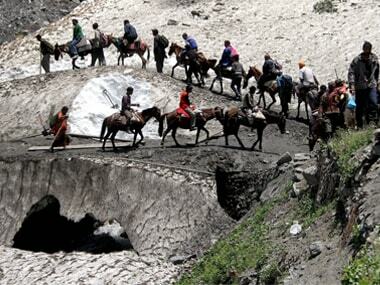 Jammu: The Amarnath Yatra in south Kashmir was on Thursday suspended from Jammu due to inclement weather. No pilgrim has departed the Bhagwati Nagar Yatri Niwas for the cave shrine, Additional District Magistrate Jammu Arun Manhas said. "Due to inclement weather the Amarnath Yatra from the base camp Yatri Niwas (at Bhagwatinagar) via both the Baltal and Pahalgam routes will remain suspended," he said. However, a batch of 1,798 pilgrims, who were stopped at Udhampur from leaving from the Pahalgam base camp in view of the inclement weather conditions, were allowed to move to Pahalgam on Thursday, a police official said. Three pilgrims and a helper were killed and seven others injured in a landslide that hit the Brarimarg-Railpathri stretch of the trek from Baltal to the cave shrine on 3 July. The yatra via both Baltal as well as the Pahalgam routes remained suspended on Wednesday because of landslides and shooting stones between Railpathri and Brarimarg. On the seventh day of the ongoing Amarnath Yatra, 5,919 yatris paid obeisance at the holy cave. Till date, 60,752 yatris have paid obeisance at the Shivling at the holy cave, the spokesperson said. 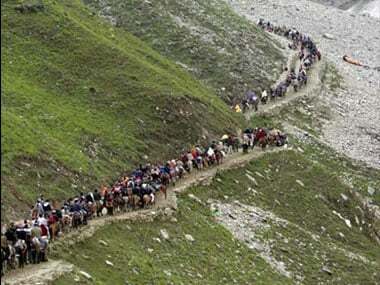 A total of 27,426 pilgrims have left the Jammu base camp for their onward journey to the Amarnath shrine. The 60-day yatra is scheduled to conclude on 26 August, which is coinciding with the 'Raksha Bandhan' festival.